What’s So Dismal About This? 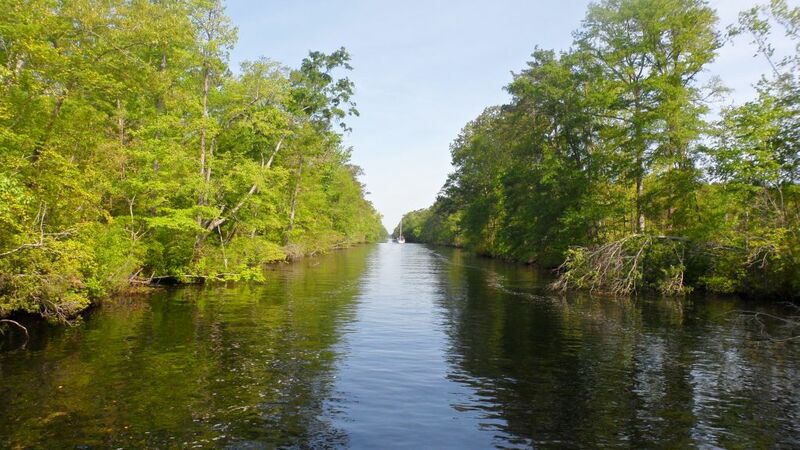 There is great controversy on the Looper Internet forums on which route to take from the Intracoastal Waterway to the the Chesapeake — the Virginia Cut or the Great Dismal Swamp Canal. For crying out loud! 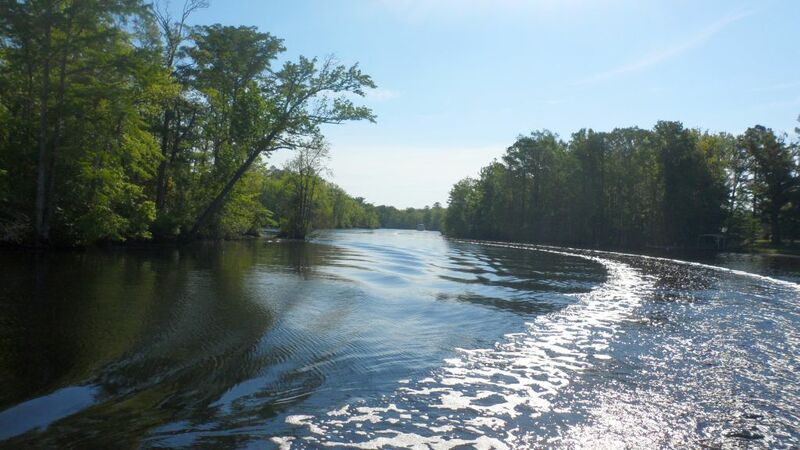 You are on the adventure of a lifetime, you HAVE to opt for the one called the GREAT DISMAL SWAMP. 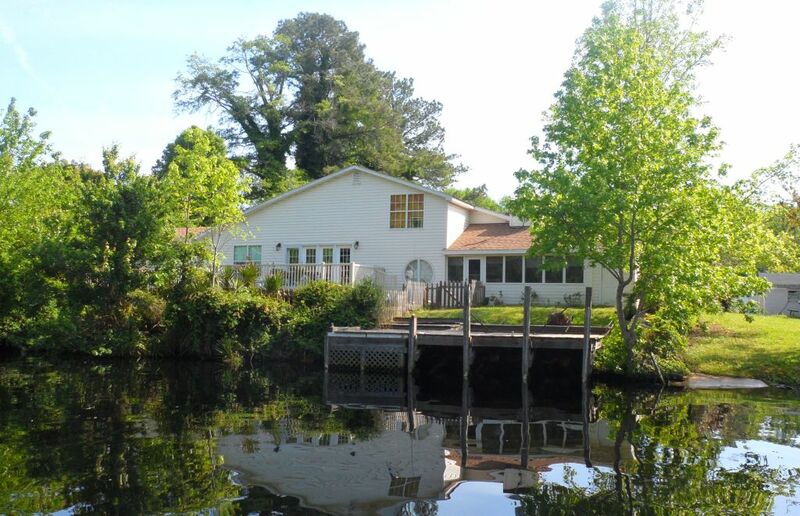 The canal begins in wonderful Elizabeth City, NC. 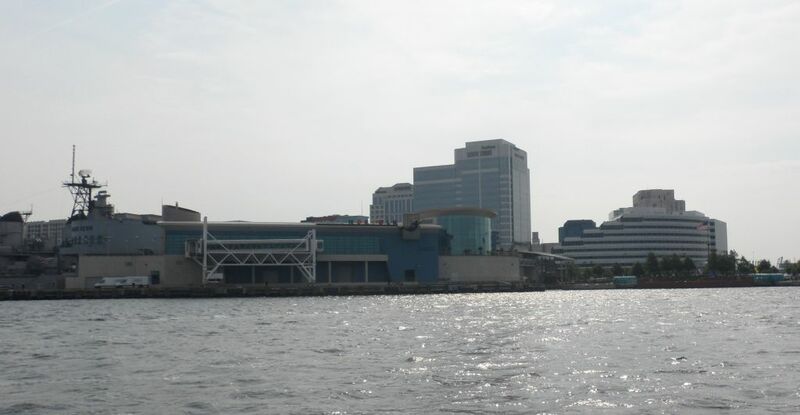 Elizabeth City understands tourism and boaters. The downtown merchants have funded a beautiful waterfront park complete with slips. The price is fantastic — free — and local volunteers called the Rose Buddies (Elizabeth is the Rose City) tie you up and offer all kinds of local information. I spent the whole afternoon at the magnificent Museum of the Albemarle. 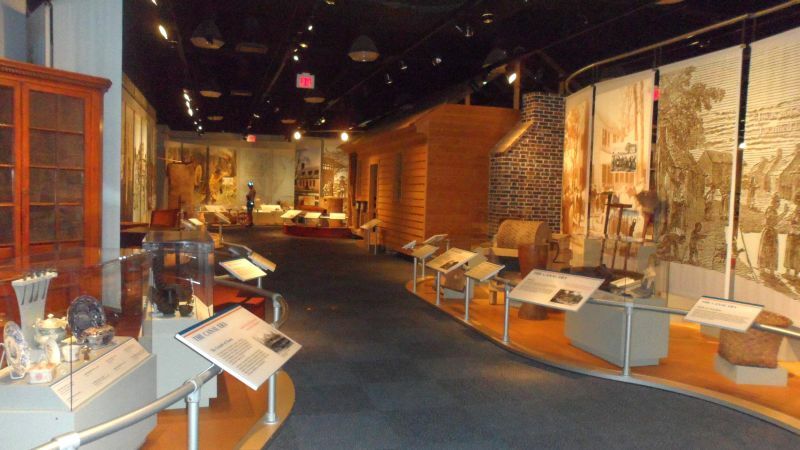 The exhibits take you on a very logical progression gallery by gallery through all the stages of development of this 400-year-old region. The story told is quite honest in admitting that the area perhaps just isn’t as important as it was, and is pretty much dependent these days on tourism and the military. 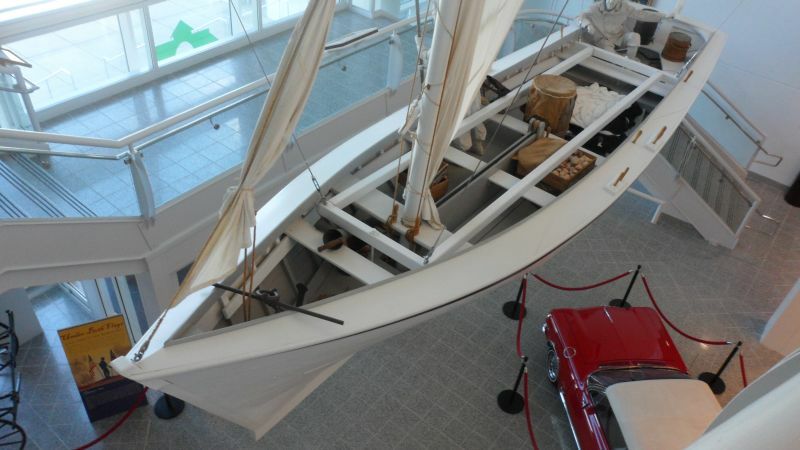 But the exhibits on Albemarle Sound’s heyday remind us in this highway-and-airplane dominated age just how critical it was as a water highway, linking the industrial Northeast to the hugely productive lands and waters of the South. 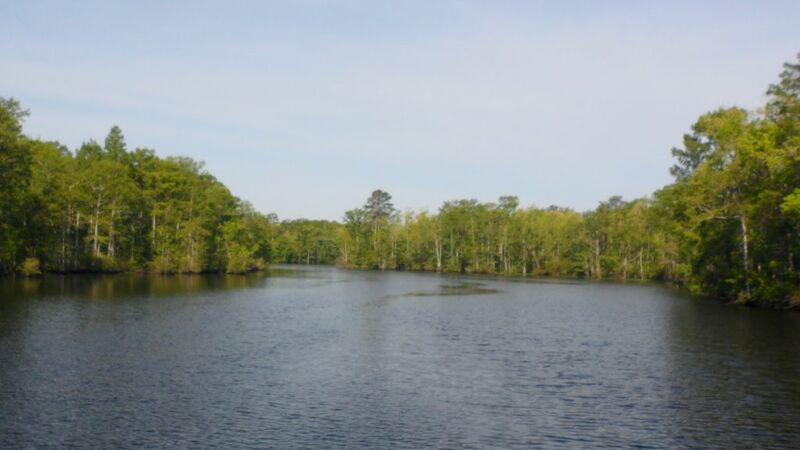 After the Dismal Swamp and Alligator-Pungo canals were dug in the early 19th century, a small ship or barge could go from Philadelphia to Georgia without having to venture into the dangerous North Atlantic. Then the trains and Civil War came and its been pretty much downhill ever since. My favorite exhibit, though, was a sleeper. In the 1950’s the Outer Banks beaches were totally segregated. And while the white beaches were pretty much the Annette Funicello-Frankie Avalon type, the black beaches developed a crab shack/nightclub scene that was ground zero in the evolution of Rythm & Blues to Rock & Roll. 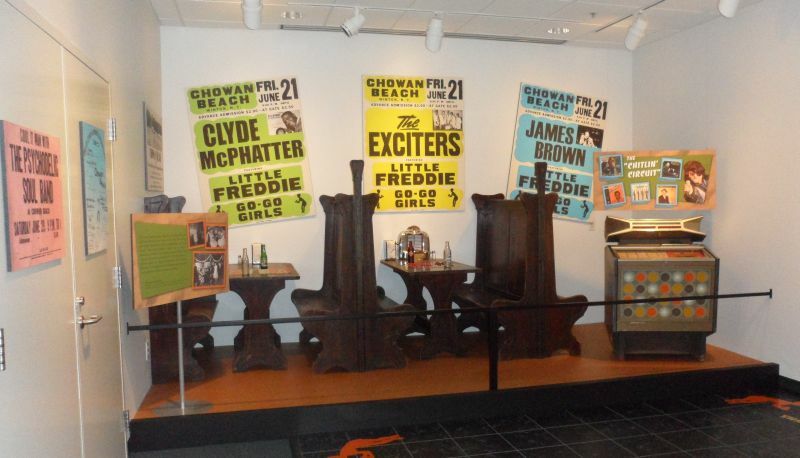 Little Richard, James Brown, Sam Cooke and all the other greats all played out on the “Chitlin Circuit” during the ’50s and the museum has recreated a part of one of the beach clubs. But all this was just prelude to the Swamp. It’s not “dismal” to me, but uniquely beautiful. You drive for miles down a tunnel of cypress, oak, gum and vines. There are birds everywhere, and as many turtles as I’ve ever seen. 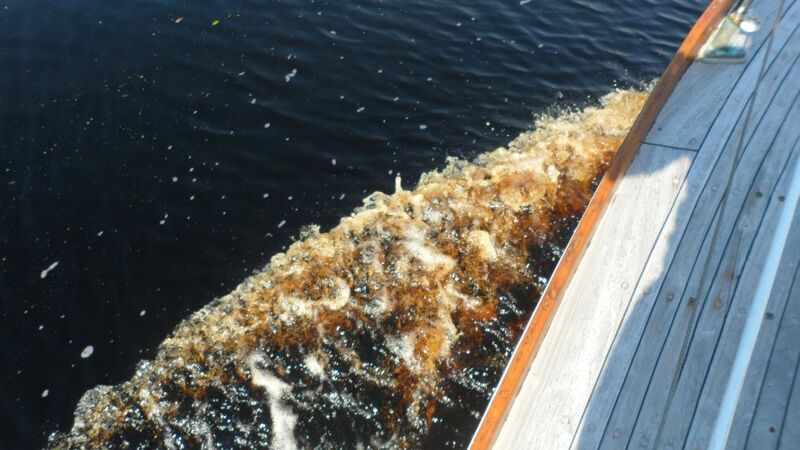 The water is brown, and when looks like the froth on a good cup of espresso as the boat churns it up. Frankly, it is ill-maintained and trees and logs have fallen in the water everywhere making it narrow and shallow, but somehow that adds to the charm because it all seems so very ancient. Then bang, whiplash, you are out of it and into industrial, military Norfolk within a few minutes of the last lock on the canal. 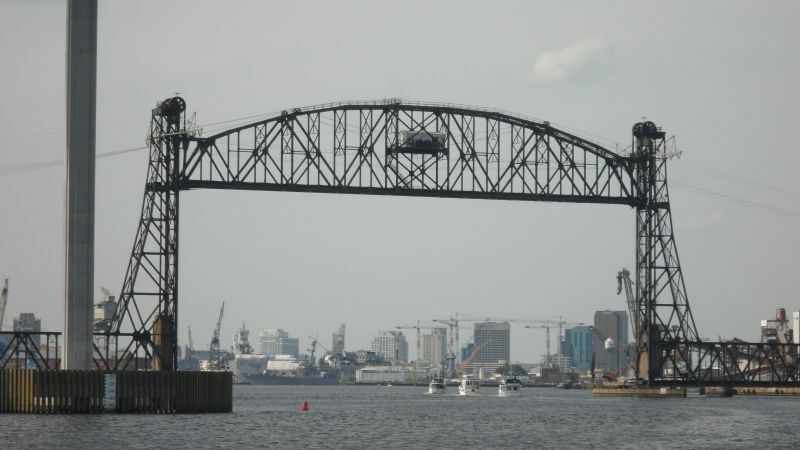 The Dismal Swamp sounds frightening, but I was much more frightened of the tugs, bridges and aircraft carriers in Norfolk harbor. Mariner’s Walk, Elizabeth City. That first boat is sure a looker. Part of the excellent exhibition on black beach life and the Chitlin Circuit. 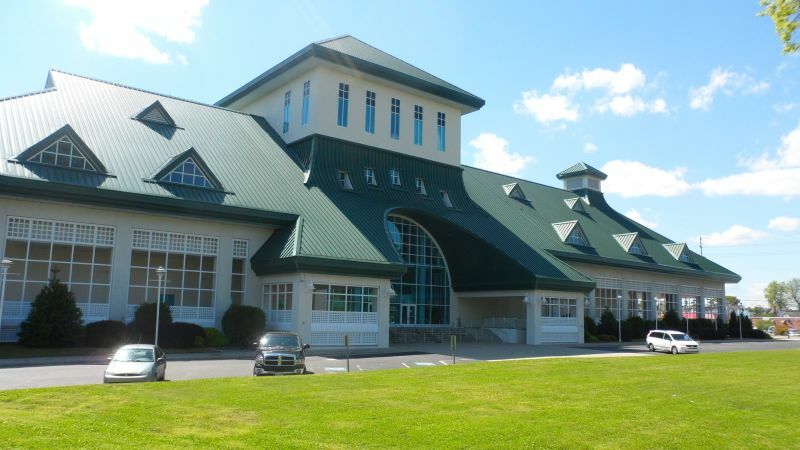 Museum of the Albemarle. Down at the end of the this exhibit, they moved in an entire historical house, just like the Smithsonian. You feel like you’re living there. 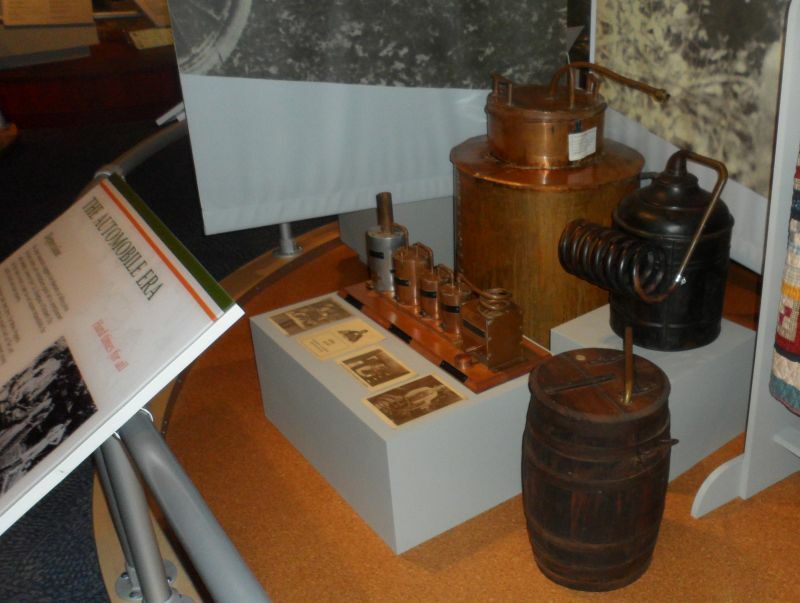 Can’t have a history museum in North Carolina without a still. Albemarle Sound shad boat — I want to build one! Car below is a 1960 Corvair Death Trap. 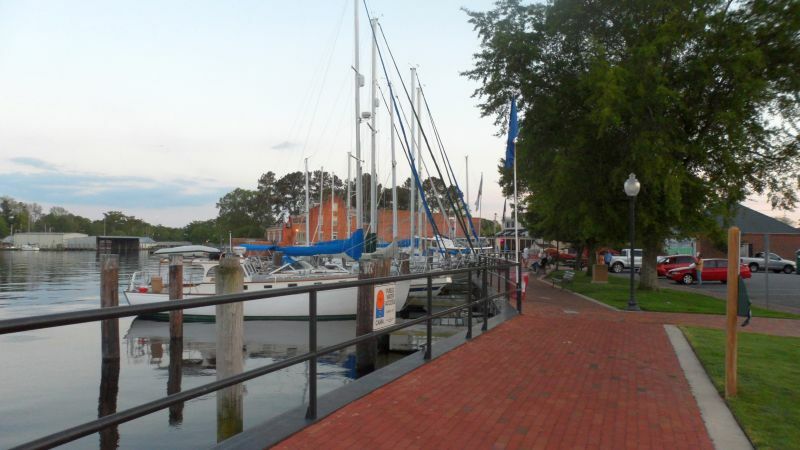 Elizabeth City waterfront right before the entrance to the Great Dismal Swamp. The Dismal certainly wasn’t the day we went through. Water has so much tannin in it it’s like cruising through coffee. Dismal is so skinny it’s basically a no passing zone for about 25 miles. Swamp People? Don’t think so. 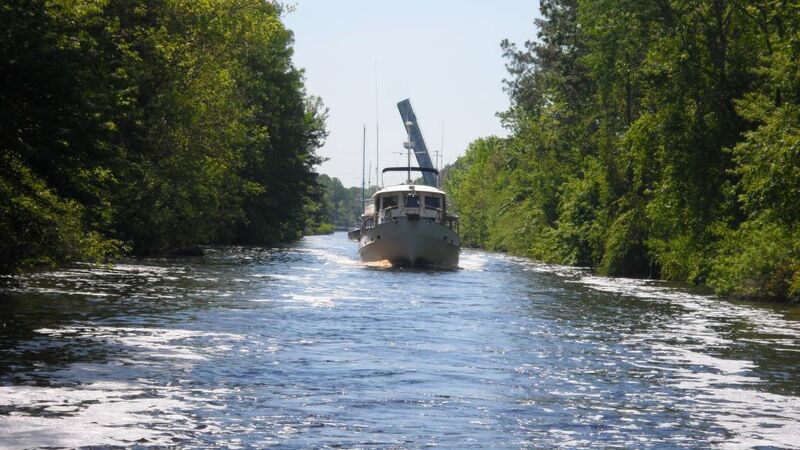 Entering Norfolk less than 5 minutes from the Dismal Swamp. Talk about a contrast! 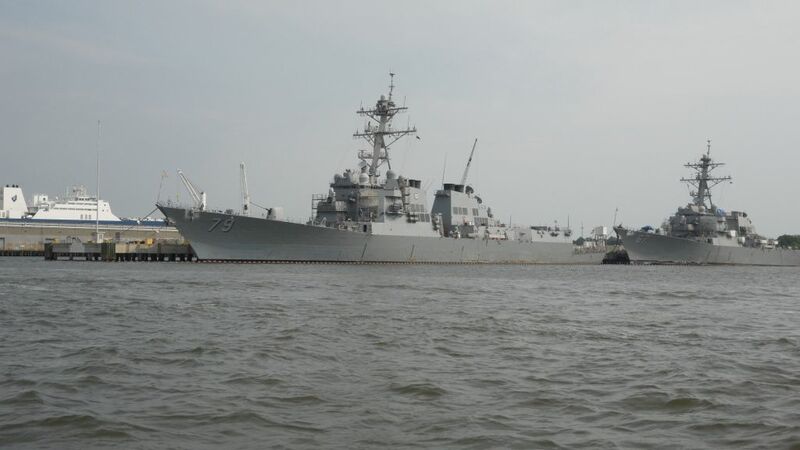 Naval ships are everywhere in Norfolk.